Wash your hair well the day you intend to straighten. This removes all build up and dirt and helps the style stay longer. Take off most of the moisture with a micro fibre cloth or just your regular towel. It’s best to take off at lest 80% of the moisture before going into the third step. Spray heat protectant over the entire length of your hair concentrating on the ends. Heat protectant is meant to help your hair from the heat. 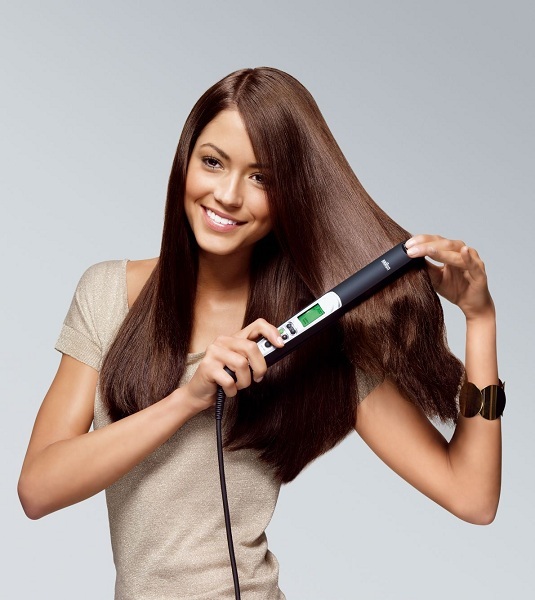 Low dry your hair afterwards with a concentrated nozzle and barrel brush. This is to avoid frizz and make your natural curls a little tamed. Spray heat protectant to the ends of your hair again and section your hair in 1 inch sections. Smaller the sections, the more straight your hair would be. Start from the end and work your way up to the top. If you have bangs, straighten those outwards to make a flick. Finish off by adding in silicone based shine spray to certain areas of your hair. Also remember not to add any water based products as this will frizz up your hair again. Also carry a headband if it’s humid outside to sling back your bangs to avoid sweat ruining your hair. I hope my routine helps you a lot and also helps make your styling more effective!